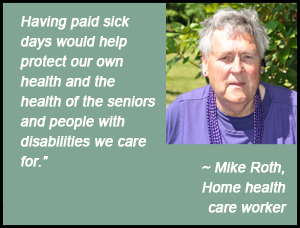 Your story will help other people understand why paid sick days are the responsible way to keep people healthy and prevent the spread of disease. Please use the form below to tell us about paid sick days and your workplace. If you’re an employer: tell us why paid sick days are good for your business and your staff. If you have paid sick days: tell us about a time when having paid sick days helped you keep your job and keep your family healthy. If you don’t have paid sick days: tell us about a time when having paid sick days would have made a difference to your family and/or your employer. Please be specific about your situation — but you don’t have to include your employer’s name (or even your own). If we like your story, we may contact you to ask if we can publish it to the website! Trouble viewing this form? Click here to send us an email instead.